Paterson 35mm tank takes a single 35mm film. Paterson Universal tank takes two 35mm films or a single 120/220 film. The 35mm tank holds one 35mm or 126 film. The Universal tank holds one 35mm, 126, 127, 120 or 220 film, and by adding a second reel it will take two 35mm or 126 films. NOTE: The reel adjusts to three different film widths. Turn the two halves clockwise- against each other until they click- then adjust them to the desired film width. Turn firmly anti-clockwise until the locking mechanism clicks back into place. NOTE: If the halves are completely separated, line up the two notches on the center core when reassembling. Loading the film MUST be done in the dark. It is highly recommended that if you have not loaded a film before, that you practice with a "dummy" film in the light with your eyes closed. 35 mm films: cut off the half-width leader, cutting between the perforations, not through them. Roll films: unroll the backing paper until the film appears. Hold reel in one hand with the entry points uppermost and facing towards you. Insert the end of the film into the grooves and pull it forward about half a turn of the reel. If the film should stick for any reason do not use force, as this could damage the film. Try tapping one side of the reel gently on the bench to free the film. If film is still stuck, remove film from the reel (see Removing Film from Reel) below and start over. NOTE: Some 35mm cameras wind the film on to the take-up spool with the emulsion out. This straightens the film and may cause difficulty in loading the last few frames because the straight film does not load so easily around the reel. 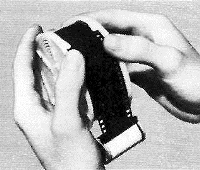 It is suggested to rewind the exposed film into the cassette a few hours before loading, so that it regains its normal curl. After loading the film, push the reel/s fully on to the black center column and place this in the tank. Place the funnel/lock over the center column and drop it into place. Turn funnel/lock clockwise until it clicks into the locked position. NOTE: The tank is now light-tight and all other operations can be carried out in daylight. Pour the first solution into the funnel in the lid as quickly as possible. Do not tilt the tank during filling. After filling with first solution, immediately insert the agitator and twist sharply back and forth three or four times, then lightly tap the bottom of tank on bench to dislodge any air bubbles which might form on film surface. Push the cap on, making sure that it fits all the way round. At the end of the first minute, and of each subsequent minute, invert the tank quickly, returning it to the upright position, and tap the tank on the bench as before. Always follow developer instructions. Some developer instructions, especially for color developers, may specify a different amount of agitation. If directions differ, follow the instructions for the particular developer but otherwise adhere to the recommendations listed herein. NOTE: This level of agitation is correct for the majority of films and developers. Consistency is important for repeatable good results. A few seconds before the end of the required time remove the cap and pour the solution out. Precisely at the end of the time pour in the next solution. Immediately put the cap on, agitate by inversion once and tap on the bench as before. Agitate again at the end of each minute. Repeat the procedure for all subsequent chemicals steps. Remove the lid and wash the film by placing the tank under a tap. Agitate the reel occasionally. More efficient washing is obtained with the Paterson Force Film Washer (CAT. # 74336-01) which ensures a positive flow of water over the film. Slightly bend film edges together by arching the free end of the film. 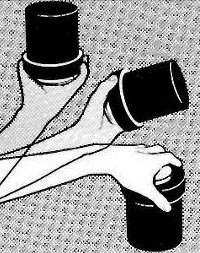 Gently pull on the free end, allowing the reel to rotate on the other hand. The film will run out of the reel as it rotates. Black-and-White Processing: Usually does not require control other than checking the solution temperature before filling the tank. Color Processing: Higher temperatures and tighter tolerances are needed for color processing, this may require external tempering. An easy way to do this is to stand the tank in a container of warm water (at the correct temperature). Be sure to follow any such recommendations as given by the chemical manufacturer. Super System 4 Tanks will process color or black-and-white reversal films. For films which require re-exposure to light during processing it is not necessary to remove the film from the reel, although when using transparent reels, exposure time should be doubled. Super System 4 Reels are made from acetal resin, which is extremely resistant to photographic solutions and withstands temperatures up to 100°C. The black tank parts are polystyrene and are highly resistant to photographic solutions but organic solvents or heat can damage them, so do not wash them in very hot water or stand them close to fires or heat sources. Wash and dry all the parts thoroughly after use. Earlier version of the Super System 4 Tank will fit with this system but when used in Multi-Reel Tanks with less that the full number of reels, a System 4 Spring Collar is needed to prevent reels from moving during processing. How to figure out solution quantities: Solution quantities needed for each size of film are engraved on the bottom of the tank. To find the total volume of solution needed for a Multi Reel Tank just add together the amount needed for each individual film.